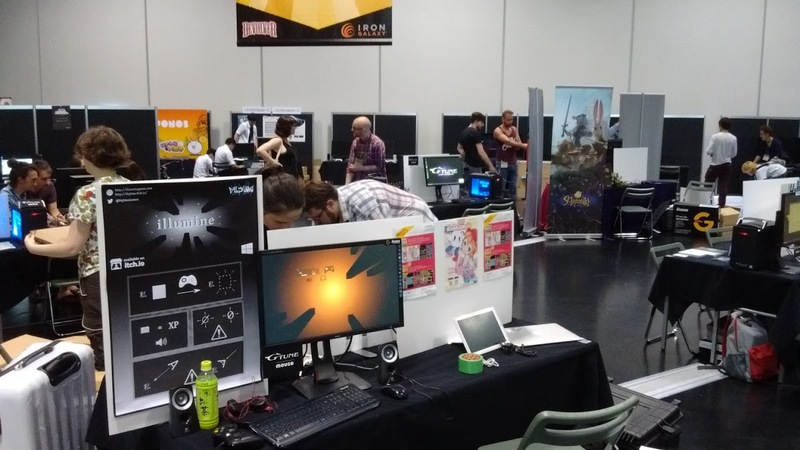 Last week I went to Kyoto to show my game illumine at BitSummit. BitSummit is Japan’s biggest indie games festival with around 100 games shown and sponsors like Sony, Nintendo, Unity or Oculus. My game illumine has been in beta for the last three months now and has been played by a bunch of people, but it was the first time showing the game to the public. The feedback was very positive. Seeing some people come play the game several times, or bring friends along because they want to show them the game is obviously a good sign. My small booth ended up really crowded. I also got some great feedback from fellow developers and publishers. I would particularly like to thank Poisoft’s Ishikawa-san. Thanks to him, illumine was featured on Poisoft’s nicinico video stream. It was a great moment of total improvisation in Japanese. Now for the surprises. On the morning of the second day I learned that Famitsu had written a post about illumine. I didn’t meet anyone from Famitsu so I guess they wander around on the showfloor undercover? A few hours later I had the pleasant surprise of receiving an award from Dengeki Playstation. I didn’t really talk that much with their journalist but at least I saw him. Finally I didn’t win any of the BitSummit awards but illumine was a runner-up for the Innovative Outlaw award, which is still huge for me. It was the first time I was showing illumine, but also the first time for me to be showing anything. So far I have mostly been working alone on my remote island of Hokkaido. Such a warm reception was a complete surprise. And I am not only talking about the 15°C difference between Sapporo and Kyoto. This is actually big news for me. illumine has been on Steam Greenlight for a few weeks now and it has been very difficult for me to gather interest about the game. The game is maybe a little weird and isn’t as pretty as the most popular indie games out there. To be honest I was starting to think that I had made a mistake. What BitSummit taught me is that it’s fine to be weird. It might actually have been easier for me to attract the public’s attention. Just by watching someone play the game you probably have no idea what’s going on. A lot of people stopped at my booth to try to wrap their head around what was happening on the screen. But I was also surprised by how quickly some players understood the rules of the game. From the very first day of development I had decided that the game wouldn’t feature any tutorials and that I would instead trust the player and let him figure things by himself. I’m glad I didn’t change that in moments of doubt. Another source of concern for me was that the game is rather difficult. It is a roguelike in which enemies kill you on contact. I thought this wouldn’t go well on a showfloor. The consequence was completely different than what I had expected. It actually got more people to watch the game. I guess watching other people lose is fun! Also the game is rather fast paced. A run usually lasted between 1 and 3 minutes. This allowed for quick rotations and visitors didn’t have to wait too long in order to try the game. The audio also was a concern as it is a huge part of the game. The music is dynamically generated by the gameplay and is telling the player about the dangers that lurk in the dark (see my previous article). I was afraid that people would experience only half of the game because of all the background noise on the showfloor. That’s why I brought an audio system (2 satellites + 1 subwoofer) that basically occupied 70% of my luggage. It was definitely worth it. I was the loudest booth in my area (all my apologies to my neighbours) and the music of the game was discernible. A lot of positive comments were actually about the soundtrack. Another lesson for me : the human body needs food every now and then in order to function properly. And coffee doesn’t count as food. Being a one man team turned out to be much more difficult than what I had expected. A huge thanks to the BitSummit organizing committee, interpreters and volunteers who helped me get a few breaks. Those guys are awesome. Illumine is still on Steam Greenlight and I noticed a boost in the votes after BitSummit. I hope it works out in the end. I discussed with a few journalists while they played the game at my booth and I hope some of them write something about the game. As for me I am nearly done with the Windows build, which means that I’ll soon be able to try porting the game to other platforms. illumine is now on Steam Greenlight and is available on itch.io.